Daily business is now much easier for this privately-held small business with WinVRS-TOUCH in place for their truck weighing. The USA-made software utilizes an Access database to store all of the vehicles, materials, jobs, and account IDs for every customer, and they now have an unlimited number of IDs. Profiles are easily built for every ID, with a stored tare weight for every vehicle. The company also wanted to add material, job number, and additional recordkeeping functions to store the information. WinVRS-TOUCH was specifically selected because of its large user friendly interface with touch-screen technology that makes transactions easier to key in for the operator and less time consuming. The customer liked the large, easily-identifiable buttons to push and the fact that they can run reports on weights and materials sold whenever needed. The large 26-inch, touch-screen monitor also allows the operator to keep their eyes up and in the same viewing angle as the scale house window, so they can provide better customer service interacting with the truck drivers. A Cardinal Scale model 205 weight indicator is connected to their truck scale which outputs weight data to the WinVRS-TOUCH touch-screen computer. At the time of the transaction when a vehicle is on the scale, the operator simply enters the ID of the truck, and if they had previously associated any other IDs they will auto fill on the transaction screen. 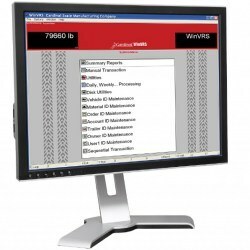 WinVRS-TOUCH automatically calculates the gross, tare, and net weights of the vehicle load as well as any accumulators that might be needed on the job ticket. The software calculates the price of the material accordingly and applies tax, if needed. Once the operator has confirmed all of the data on the screen, they then select “OK” and print a predefined ticket, also created in the software. The transaction is stored in the database, and if a ticket gets lost, reprinting a new one is just a keystroke away. At the end of a business day, the user can select a number of different reports that reflect overall site activity. It’s also worth noting that Cardinal also offers additional upgrades which allow you to take the WinVRS software even further, for example being able to send transaction data more efficiently to a corporate office every day after business closes. Cardinal Scale offers several different ways WinVRS can be utilized to assist with this data transfer. The office site license (WinVRS-OFFSLSW) allows their corporate office to e-mail, transfer files via USB drive, or remote into the main WinVRSTOUCH PC. This allows the customer to export/import daily transactions, run reports, and reduce data entry for the corporate office down to very little time necessary. Additionally, WinVRS-ACT interfaces with accounting software for QuickBooks integration. The corporate office could export/import daily transactions into their invoicing software for even less data entry.